Free Shipping on All Orders in the USA! Boswellia, also known as frankincense, has been a vital component of Ayurvedic medicine for thousands of years. 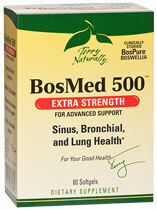 Modern research has confirmed the effectiveness of boswellia for healthy sinus, bronchial, and lung function, as well as intensive intestinal support. Other Ingredients: sunflower oil, gelatin, glycerin, sunflower lecithin, purified water, beeswax (yellow), silica, caramel color (softgel), and titanium dioxide. No: sugar, salt, soy, yeast, wheat, gluten, corn, dairy products, artificial coloring, artificial flavoring, or artificial preservatives. Suggested Use: 1 softgel, once or twice daily. Did You Know? The boswellia tree is native to India. It grows in very harsh, dry environments. When the bark of the tree is scraped, it secretes a resin called "tears". These tears are better known as frankincense. Boswellic acid extracted from the tears of the boswellia tree has been used in Ayurvedic medicine for hundreds of years. Caution: If pregnant or nursing, consult a health care practitioner before using. *These statements have not been evaluated by the FDA. Our products and services are not intended to diagnose, treat, cure or prevent any disease. Nutritional benefits may vary from one person to another. Please Note: We do not offer refunds on any hair analysis tests once you've purchased them. Keep in mind the hair analysis kit submittal form you receive is valid for up to one year in case you need to wait before submitting your hair sample. All material provided on this site is for informational and educational purposes only. It is not meant to replace or substitute for the recommendations or advice of your physician or medical provider. Please consult a health care provider regarding the applicability of any opinion or recommendation with respect to your symptoms or medical condition. Products are offered for use in therapies that may benefit normal function and structure. These statements have not been evaluated by the Food and Drug Administration. Products are not intended to diagnose, treat, cure, or prevent any disease.